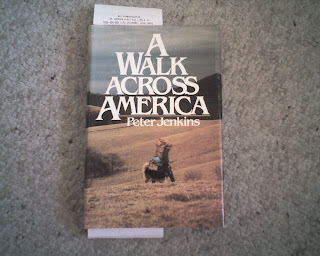 This, Peter Jenkins guy might walk across America, but I prefer to fly. I, will however, read his book while on vacation. This guy graduated from college in 1973, was disillusioned by what was going on in America and decided to walk from NY south to New Orleans and then across the country to California. This is the story of his trip to N'awlins. This book was published around 1979 and I got it used at Bookman's (a great used bookstore). So, now I start my journey to West Lafayette, Indiana and then to Cincinnati, Ohio. Not sure how much I will be blogging in the next ten days. I will, however, get in as much running as my weary legs allow. I'm looking forward to getting out of Arizona this week. I'll be spending part of our vacation in Indiana (Purdue country) and part in Cincinnati, Ohio. This Saturday I have a 4 mile race scheduled near Purdue. I'll, also get to run down some corn lined country roads, along the Wabash River and around Winton Lake in Ohio. Not sure how often I will blog, but you know I'll take a lot of pictures. But, for the next few days I'll have to put up with the temps. It was 105 when I left my house tonight. But, it felt like . . .who I'm I kidding, it felt hot, very very hot. 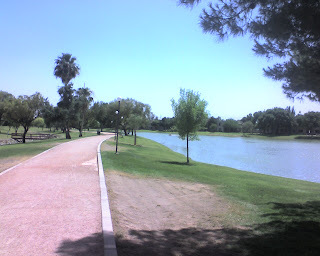 My plan was to run to Desert Breeze lake, do a few laps around the lake and head back home. It would be a 4-5 miles. Around the 1.5 mile mark I started feeling dizzy. My hands were swollen and I was toast. I had water with me and drank it liberally. I'm sure I was dehydrated. I finished the run by walking. You never know when your life is about to take a turn. Great news comes in the mail. A call comes in the middle of the night. You wake to planes crashing into high rises. Some news is good and some news is bad. And in between life goes on. You do your runs or swims. You hike or bike. Those miles add up for your personal health, both mind and body. The Adkins family found themselves at such a point. Their son Kevin died at age 18. The family made the turn and made the hiking mileage about something more than just fitness. I encourage you to read their story of a journey from Arizona to Montana. A journey to save lives. Or as Barry Adkins says, "something very good will come from this". Gatorade & gels - ??? I didn't know I could go so slow. Mike in Wisconsin and others suggested I slow down to run longer. I've heard this suggestion before and I thought I was running as slow as I could, but tonight I found a new gear. And it was really slow. I think I took a walk break and it was actually faster than my running (just kiddin'). I added a photo at the top of my blog. I hope you like it. This is part of the course of the Lost Dutchman Marathons. The half marathoners run it both ways. The Full marathoners start on the other side of the Superstition Mountains, wrap around the southern edge (towards the right) and then follow this road into town. On the other side is where the Dutchman had his gold mine. It is what is lost. The dutchman told his best friend the location of the mine on his death bed. The best friend could never find the mine. People are still looking for it. Tensa wa yugen da go, doryoku wa mugen da. Toshihiko Seko is one of the greatest Japanese runners of all time. He's won the Boston, London, Chicago and Tokyo Marathons, as well as, the Fukuoka Marathon four times.His coach was a Mr. Nakamura from Wasada University. The quote above is from him, "Talent is limited, but effort is unlimited." Is that so true? I know that I don't have the talent or even the body of many runners that I race against at the local 5k, but I know that I can give the same effort in my training and when I do my times will get better and better. First I spent 40 minutes in our pool running. I got my heart rate up around 106, with an average of 95. We have a in ground pool that is 3-4 feet deep on both ends and about 5 feet in the middle. It's about 20 feet long. I ran along the perimeter until I started getting blisters. I'll have to get my water shoes for the next time I run in the pool. Since I couldn't get my heart rate up much in the pool, I ran 2 miles in the 100 degree weather at a 12:20 pace. The running got my HR up to 164 with an average of 145. Much better. It time to fess up and get your opinion. For the past two months or more I've been walking much more than I used to. I can run the first mile in a little over 11 minutes. After that I run maybe a half mile and I end up walking again. The rest of the run I'll run from .4 to .6 of a mile before I walk. My run to walk ratio is about 60/40. Maybe 70% running. I can remember running 5 milers before with only 1or 2 walk breaks of 1-2 minutes. I'm not sure the reason. 1. It could be the heat. 2. It could be mental. I have a football mentality where you only need 10 seconds bursts of power, not slow and steady for an hour. 3. It could be that I'm up about 5 lbs and the extra weight is having an effect. Any opinions would be appreciated. The good thing is I'm not letting it get me down. I'm still enjoying my workouts and feeling like I'm improving. I've been reading Katie's blog off and on for almost a year. She's done a wonderful job of losing weight. She did it with something called "The Firm". They were so impressed with her that they had her come out when they made their new info mercial. I'm watching it now. She's supposed to be on it. She's lost 80+ pounds. 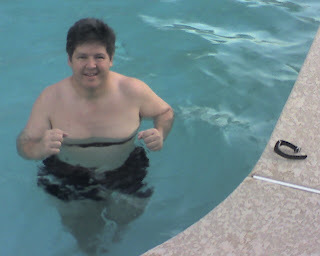 Steve Getting Fit in Ohio is a new blogger that I have added to my favorites. Steve's where many of us were in the beginning. I'm partial to folks from Ohio, so check out his site and give him his props (that's what the young kids say). Bigun in Florida is a tri-athlete and is pretty funny. I think I'll monitor his blog. You should too. Matt in Iowa is a bit further along than Steve. Check out his blog, especially if you've forgotten the joy of running when you first started out. I've read a lot of what Obrats has written in Runner's World Beginner's Forum, now I'm reading his blog. He's well ahead of me, has lost a bunch of weight and his blog is a great read. Another guy that's shed some weight is Jeff in Maryland. These are my new favorites. Of course, I encourage everyone to read them and all my old favorites on the right side of this blog. All of you encourage me to run my @ss off. 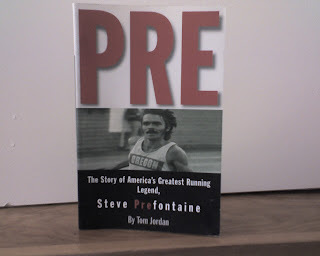 Book Reports: I just added "Running with the Legends" and "Pre" to my book reports. If you would like to add a book report, I'd love to have it in my collection. Just send me an email with your report and a picture (if possible) to pat@RealtySecrets.net. You'll get credit for the report and a link to your blog. Or if you just want a good running book to read, you'll find a short report here: Pat's Running Book Reports. Softball Update: We played the first place team last night. They score about 17 runs a game and we held them to 9 runs thru 5 ininngs. Going into the last ininng (6th), we were down 9-6. I led off with a single and moved up to second on a bad throw by the right center fielder. I, eventually scored in front of two other team mates to tie the game. A fourth team mate got thrown out at the plate on a really close play for the final out. In the bottom of the ininng we got two outs, but a runner scored before we could get the last. So, we lost 10-9 and now have 3 wins and 3 losses with one game to go before the tournament. Game time temperture was in the high 90's, maybe 100 on the nose. The sun was down, so it was a great nite to play softball. Got in a short run today. The third day in a row. I've run 4 of the last 5 days and was on the stationary bike for 20 miles the day I didn't run. A neighborhood run at 8 pm. I felt good. My legs and knee felt good during the run. My feet felt great in the beginning, but felt a bit tired towards the end. I think that's because I have to get used to the new shoes. Last night I ran and my legs hurt the whole time. My feet hurt the whole time and my left knee hurt the whole time. Usually this is not the case. 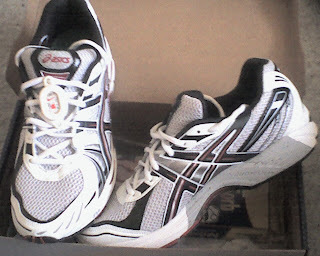 So I ran on down to my favorite shoe store, Performance Footwear near the campus of ASU. They have a treadmill and will analyze your gate to determine the best shoe for you. I thought that maybe another shoe might help my knee issues. The salesman showed me a video of my feet in motion. I noticed that my feet almost cross in front of each other and that I do still pronate or have my feet turn in when the land. I, also, notice I have fat ankles (but that's not an issue). He asked me if I had lost weight since the first time I was on their treadmill. After I confirmed that, he suggested that I probably don't pronate as much as I used to. I probably could go with a less sturdy shoe and that it might help me with my knee issues. My first 2 shoes were New Balance 857's and they lasted 291 and 391 miles respectively. I still wear the first one's around town. Comparing them to my new treads, I notice they sure are dirty. 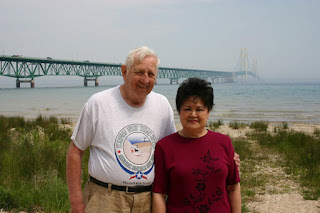 Here's a picture that's a few years old of my dad and mom in front of the Mackinaw Bridge in northern Michigan. And another in front of the Alamo. My dad, a veteran of the Korean war meet my mom while stationed in Japan. They raised four kids, me being the youngest in Cincinnati, Ohio. He was a cook in the army and spent most of his life running restaurants in southern Ohio. I remember his employees always telling us what a great boss he was. I, also got the pleasure of working during college with my father in the summers. I was always amazed how he worked harder than anyone else in the restaurant. While, most managers would sit around and order their staff to clean the table, serve the food or fill the damn salt shakers, I would see him busing tables and helping waiters serve the food. He wasn't good at delegating work, but you love'd to work for him. He now lives a comfortable life in retirement just north of Cincinnati. Scratchy Voiced Singer: Real American Heroes. Deep Voice Announcer Guy: Today we salute you, Joe Monahan, dad to Margie, Thom, Theresa and Pat. Scratchy voiced singer: Mr. Monahan, dad of four. Deep Voice Announcer Guy: You had the courage to raise two daughters and two sons. To keep them on the straight and narrow. To work long hours in the food industry and to serve your country in it's time of need. Scratchy voiced singer: Sit up straight and eat your veggies. Deep Voiced Announcer Guy: You took your family on some great vacations to Florida, Tennessee and to Niagara Falls. Scratchy voiced singer: Play some putt putt in the smokey mountains. Deep Voiced Announcer Guy: So crack open another beer and enjoy your Cincinnati Reds as they battle out of the NL Central cellar. The Reds maybe last, but Joe Monahan, you're first in the minds of your family. Scratchy voiced singer: Your a great dad, I hope you know it. I, also want to wish a happy father's day to my father-in-law, Harry Potter. Yes, that's him with his daughter, Amy (my wife of 21 wonderful years). He gave my son signed copies of the first two Harry Potter books. We enjoy the coincidence, but I'm not sure he does. We celebrated Father's Day on Saturday. I started the day, as you know, by running a 5k. Then, after lunch and before a listing appointment I had scheduled at 1 pm, I got to open presents. My daughter gave me a Beatles CD. I'll add the songs to my Ipod and get some new stuff (old stuff) to run to. My son gave me a copy of The Natural with Robert Redford. I really like baseball movies. Then my wife, Amy gave me a Flat Screen TV for my office. We usually don't buy expensive items for each other. We're pretty conservative. But, every few years either she or I surprise each other with something special. I wasn't expecting this, but I sure do like it. 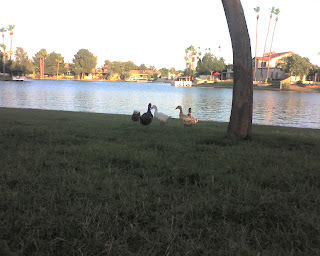 I then went to my listing appointment were I am listing a new townhome in Tempe. You can learn more about it at http://www.townhomesonly.com/ or my townhome blog. Finally, I got to watch the Reds beat the Rangers on my new TV and write this post. I looked at the alarm and it was 1 am. I hadn't been able to fall asleep after the softball game and I needed to get up in 4 hours to run in the Arizona Road Runner's Summer Series race. 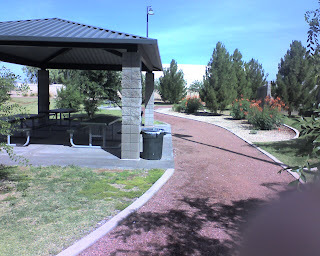 It was in north Phoenix at Reach 11 Park. There's a part of the park called the Horse Lover's Park with beautiful dirt trails that are well shaded. That's were the race was going to be. As I was driving north I looked at the temperature readout in my car. 81 degrees at 6 am. Typical for Arizona this time of year. Not a cloud in the sky. This was a great place to run. Lots of parking and the dirt trail was fantastic. The race results are not online yet. But, I used my nike+ to time myself. It's a chipped time race, so I can expect to see results in a few hours. I keep my Ipod in my fanny pack. The pocket is in front with a drink holder on my left hip. I don't like having the arm band on, so I usually have to take my Ipod out everytime I want to hear my current pace or how far I've traveled. I'm working on a better way to get this info. Today I taped a tic tac to the center button. The Ipod sits in the pocket and whenever I want the information I just push on the pocket. The tic tac pushes on the center button and I get the voice with the info I need. My Ipod and the mile marker were within .01 miles of being in sync. I did the first mile in 9:49. 10 seconds off my personal record for the mile. I ended up taking a couple walk breaks during the second mile and had a time of 12:06. The sun was getting to me. Luckily there were trees and shade thru most of the course. Most running in the valley is wide open with very little shade. I felt like I was in a maze with 8 foot high trees on either side of me. The last 1.1 miles I ran in 12:58, an 11:47 mile pace. Of course, the last 100 yards or so I sprinted in and past several people. My total time from my Ipod was 34:53, a 11:16 mile pace. Again, ARR did a great job of running the event. The course was exceptional. The volunteers were plentiful with almost no waiting to get my bib, chip or for refreshments afterwards. The optional shirt is really nice. I would have taken pictures, but I left my cell phone at home. My next race is on June 30th near the campus of Purdue University in West Lafayette, Indiana. We visit the relatives around this time every year. My father -in-law, Harry Potter is a professor at Purdue and my mother-in-law, Cathy Potter used to work at Purdue in development. 1. I like to read about other people's running and races. I know it doesn't sound weird to you, but to the rest of the world, it does. 2.I cannot read in bed. I will fall asleep no matter how good the book is. 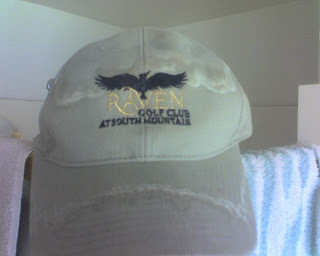 3.I wear a cotton baseball cap when I run. It gets drenched in sweat and I like to use it as a barometer of how hard I've run. My daughter thinks it's really gross. 4. I coach my daughters volleyball team. I've never played volleyball and don't know much about it and eventually the kids are going to figure this out. But, I've fooled them for 2 years now and I think I can fool them for a couple more. 5. I like 70's music. Not so much the disco stuff, which I guess makes it less weird. 6. My daughter is really into the Gilmour Girls. She has every season on tape. I can't read when she's watching the show, because I get caught up in it. I can ignore other shows, but I can't ignore GG. But, I'm not into the show. Honest. Angie tagged me. You should check out her blog and her Grand Canyon photos. I really dig the Grand Canyon and she ran it rim to river and back. And I'm tagging . . .
you. If you've read this and haven't been tagged by someone else. Your it. Softball Nite: We played the Blind Bats. It was a pitchers duel. and they lead until the last inning. We scored four runs to go up 6-5 and all we had to do was get three outs to win the game. The first batter was a women and I got her out on strikes. The second batter hit to the shortstop who threw it a bit high. The first baseman couldn't make the play and like that, they had a runner on second. The next woman hit it back to me, the pitcher. I looked the runner back and threw to first for the second out. The runner ran anyway and made it to third, barely. The last batter lofted a fly ball to our left fielder. He came in a bit too far and we thought he was going to miss the ball and the game would be tied. At the last moment he leaped up (he's a big guy, so it wasn't much of a leap) and barely caught the ball. We won. We're now 3-2 with 2 games to play before the tournament. I have to go to bed now. I have a 5k in 8 hours and 15 minutes. Goodnite. When you're running in the desert you have to plan carefully using Weather.com. Should I run in the daytime, early when it's only in the 80's or should I run after dinner when it's in the 90's, but the sun is down? I opted for a 100 degree run at sundown. And it was the bomb! 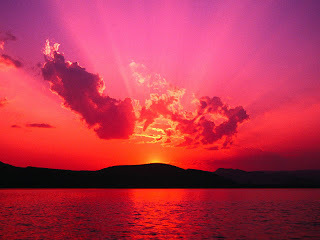 Believe me, I'd rather run at nite, than when the sun is shining down on you, even if I have to run at a higher temp. I walked out my door and it was sizzling. If your not from around here, imagine walking into your local dry cleaners and hopping on the treadmill. The humidity is real low, but the heat just attacks you. No sun is a plus. So I ran hard the first mile and was at about a 10 minute pace (no laughing, that's hard for me) for the first 3/4 of a mile. At that point I had to dial it down. But, it felt good to run with a bit more urgency. I finished the first 2 and half miles in just over 30 minutes and continued on running. Tuesday morning (with the sun) I got 4.7 miles done in 1:04:06. Today I got 5.02 miles done (in the dark) in 1:02:45. I think I'm gonna run at night for the rest of the summer, even though I do like visiting different locals and taking photos. Up Next: The ARR Summer Series #2 Race at Reach 11 Park in north phoenix. This is a 5k race that will start at 6:30 am. Should be in the high 70's at race time. No, I didn't run anywhere near this picture. I just thought you might be tired of looking at canals. I did read a great blog. Jeff, from Baltimore just started his, but he's lost well over 100 pounds so far and has some very good posts. Check it out and give him some props, he's done a hell'va job. You know I'm a baseball fan. My three favorite teams are the Reds (hometown team), the Diamondbacks (I live in Arizona) and the Yankees (you gotta love an owner that puts winning ahead of making money). Well, the Dbacks and Yanks are playing each other over the next three days. Both teams really need to win. I'll enjoy the games (diretv), but not sur who I should root for. 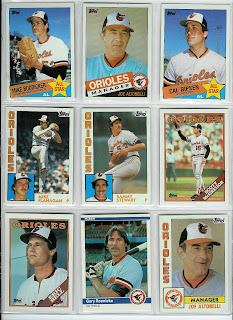 The following picture is for Jeff from Baltimore. Don't hate me for likeing the Yanks. I parked in the parking lot in Dobson Ranch that I ended my run the other day. It's on the canal that runs just south of Guadalupe road. From there I ran west for 2 1/4 miles to Rural road. The canal is very straight, loose gravel without much to look at. But, there's no traffic and just a major road each mile to cross. Here's a picture of the canal at the highway. The water has to go down under the service road (Price) and then pumped back up to the surface. Here's the dam on the west side of the highway and the water is really moving. I ran a total of 4.68 miles in just over an hour. I started around 7:45 am. The first two miles went well. After that I did a lot of walking. It was getting hot (low 80's) and I'm just not good with the sun broiling down on me. I have a 5k race this Saturday morning. I hope I can get a bit more indurance built up, so that my time is in the low 30's. Luckily the race starts at 6:30 in the morning. Dobson Ranch to the Canal. Didn't get up to run in the cool morning. So, instead of running when it was in the low 80's, I ran when it was 95 degrees and sunny. Yes, 95. As my daughter was participating in the Mud Pie Mania at church, I took time to run. Mud Pie mania is basically playing with food like this slippy slide covered in tomato sauce, catsup, mustard and water. 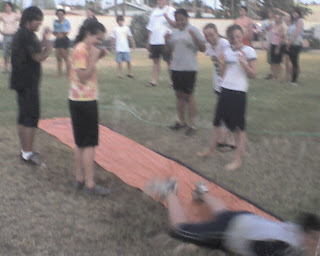 That's my daughter in the orange. I passed on the condiments and ran south along the lake, past the ducks to the canal. Most subdivisions in Arizona do not have lakes. It just happens that the one's with running paths, tend to have water to look at too. 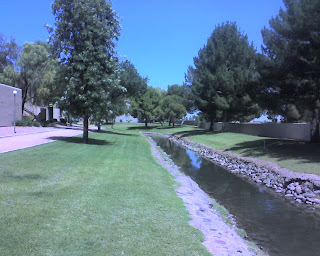 Dobson Ranch has mutliple lakes with paths and is on the north side of a canal. So, for runners you have 1.5 miles of paths heading toward the canal and miles and miles of canal to run on. 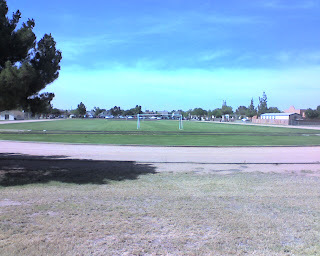 I could have gone west all the way to Kiwanis Park or east all the way to Freestone Park in Gilbert. When it's 95, I chose to run to the canal and back for 4.6 miles in about an hour. A good workout. See the Ducks? I had to lay down for this shot. It's amazing I got back up. 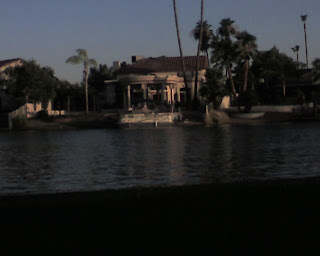 There's some nice homes on the lake. Not sure why this pic is soo dark. The canal to the south. The power lines aren't nice to look at, but the path is well groomed. I looked back to when I started running. Like many runners, I didn't keep records at that time. But, I do remember walking out the front door and running past 10 homes before I was totally winded. I finished walking around the block and declared myself a runner. Since then, I've run 662.4 miles in 5 days and 15 hours. That's like running from my home in Chandler, AZ to Las Vegas to Los Angeles to San Diego. Since then, I have raced in Six 5k's, one 10k and three half marathons. The three halfs were back to back to back. In January I ran the Rock and Roll half in Phoenix. In February I ran the Lost Dutchman half in Apache Junction, AZ and in March I ran the Valley of Gold half in Tucson, AZ. Since then, I have lost over 30 pounds , my cholesterol has dropped into the good range and my stamina has shot through the roof. Since then, I have run in Indiana, Ohio, Arizona and California. I have run in front of two parades, alongside several lakes and canals, at night and day and I have even lead a half marathon at the 2 mile mark. What's in store for year 2? I have several 5k's lined up. I want to run the New Times 10k (I believe it's on my birthday this year). I want to run the Mesa Turkey Trot again. I want to run at least one more half this year and run 3-4 half's before June of next year. I want to lose another 30 pounds. I want to do a major hike. Probably the Grand Canyon. I started running in June of 2006 and my life hasn't been the same since. I was looking over my weekly mileage since the end of July last year. I ran every week but one. The one week after my third half marathon. I was drained and needed the time. My mileage is down lately, due to runner's knee and the hot weather. Baseball season played a little part in it too. 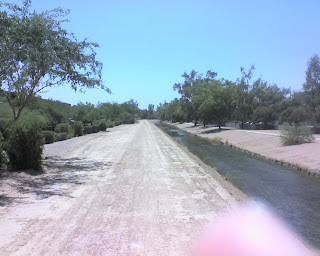 I ran the canal that goes into the subdivision of Gila (Hila) Springs in Chandler, AZ. I parked along Kyrene Road that is about mid way in the run. You can park in a commericial lot that has a couple restaurants. There's a coffee shop run by a church on the north side of the canal, but I'm not sure when it's open. There's is also a new SOMA Restaurant on the corner south of the canal. SOMA sponsors a lot of races. Check out their website, it's an interesting restaurant. I ran into the community on the second part of my run. It has a great green space with two lakes, a big fountain and play area. The path is crushed gravel and great to run on. It ends on the north side at Ray Road. You can cross the street and run in Warner Ranch. They have concrete trails that go for another half mile. You can see it's a beautiful run. There is a sign that says it is just for residents of Gila Springs. I doubt they check the runners. The first part of my run was west of Kyrene Road. It is the canal that goes through an office park. On the north side is a concrete sidewalk. On the south side is a wide dirt trail. It runs west and then south past Chandler Boulevard and down to the highway. Once you are past Chandler Boulevard you have to run on the east side. There is very little space on the other side. It is not somewhere you would want to run at night or even by yourself, since there aren't many businesses. It's very isolated. 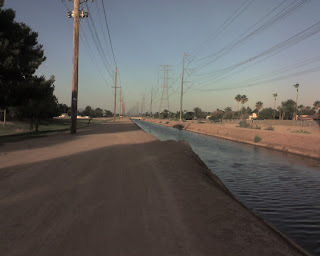 This is the canal that joins the trail I ran on yesterday at the aquatic center. Not much shade. I will only run it and I want to combine the Twelve Oaks run with the Gila Springs run. It was a cool day today (arizona standards). 85 degrees at 2 pm with a slight breeze. I didn't get to run this morning, so I took a little time off work to enjoy the day. I got 4.01 miles done in 54:09. Between the warmer weather and stopping to take pictures my times aren't as good as they were in the fall. Hopefully, I'll get that back as the weather breaks. It's just not gonna break anytime soon. Volleyball Note: No, I'm not playing volleyball, but I am coaching my daughter's team. We're in a non-competitive church league. Last night was our first game. We finished 2nd last year and really want to win this year. OK, it's a bit competitive. We played against two churches last night. The first game we won easily. In the second game, we won the first set, lost the second set and then won 15-14 in the final set to win the game. It's rally scoring, so whoever one the last point was the winner. They set the ball over one of our guys head and he made an incredible overhead save to win it. I like communities that have biking/running paths. 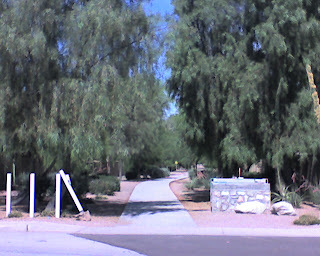 Twelve Oaks is a subdivision in west Chandler, Arizona that has the nicest treelined path that stretches from Stellar Airpark to the West Chandler Aquatic Center and to a canal. This morning I did my run, intending to do a 5k. I park in the center of the community and headed west toward Kyrene Boulevard. Here, I was planning to turn around until I saw a gravel road next to the aquatic center. Being adventuresome, I ran past the sign that said private property (I think it was for the fenced field, not the drive) and ran outside the fence of the Bark Park, past the baseball fields and to the end of the road. 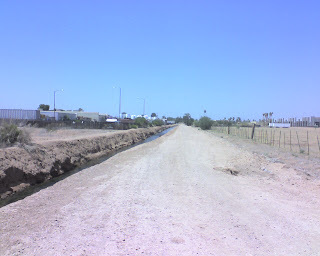 The road lead to a canal that will lead you to the community of Gila Springs (pronounced HILA) I'll have to run that part of the canal on another day. I then headed onto a really nice gravel path that winds around the ball fields. I looped around this park that has the aquatic center, bathrooms and probably showers. Made my way back to Twelve Oaks (there are a lot of trees, not sure if they're oaks) and retraced my steps back to my car. I ran past my car. The path is concrete with lots of grass on either side. But some of the trail is surrounded by gravel. You have to go over several neighborhood roads, but there's not much traffic. Kyrene Road was the only busy street (it goes to the highway). As I headed east I past a middle school with a track. There's a fence between the path and school, but if you run to the east ball field, you will find a gate big enough for one person. You won't be able to get a bike through it. 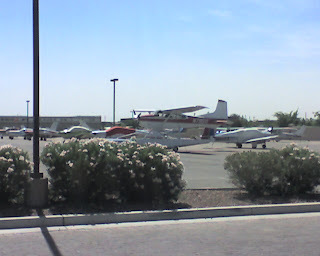 I ran further east until I arrived at Stellar Air Park. Stellar is a residential community with a small air field. Many of the homes have their own hangers, so pilots can land and taxi home. If you'd like to do this run. Go to the corner of Rural Road and Chandler Boulevard and turn south. The turf area directly in front of you has a road on it's west side (right), go to the end of that and park in the shade. You'll have about a half mile of path going east and 1 mile of path going west. If you go over Kyrene Road you can run for another 8/10 of a mile by running on the outside of the park perimeter. 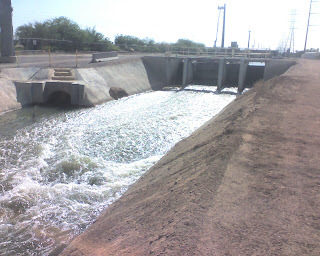 Or you can run north on the canal and run 2 miles to Ray Road though Gila Springs Subdivision. What a fun run. It was 85 degrees, but I had a cool breeze the entire run. I did stop and take lots of pictures, so my time isn't great. 4.07 miles in 55:37. As you know I really like baseball. Here's my National League All Star Team. I really wanted to pick some Reds and Diamondbacks, but none made the cut. I do think that Griffey(Cin), Dunn(Cin) and Byrnes(AZ) are having great years. I'm glad to have two brewers on for Big Mike up in Wisconsin. I would have had Hardy on too, but I like Reyes for his speed and better defense. That was the hardest pick for me. American League All Stars on another day. We like to keep our kids busy in the summer, so my son decided to take a class on computer repair at East Valley Institute of Technology. It starts at 7:30 am and he isn't ready to drive by himself, so mom and dad get to taxi him back and forth. This morning was my turn, so I put on my running duds, took Tyler to EVIT and then headed on over to the Mesa Canal Path for a 4 miler. June 16th - Arizona Road Racers Summer Series #2 5k at Reach 11 Park. June 30th - Wabash River Runner's Club 4 Miler. - West Lafayette, IN. 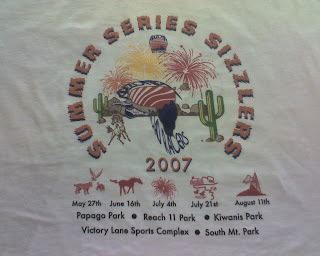 July 21st - Arizona Road Racers Summer Series #4 5k at Kiwanis Park. August 11th - Arizona Road Racers Summer Series #5 at South Mountain Park. Softball & Running, a winning combination. Friday nite is softball nite. Our team has one win and one loss so far. I usually pitch all the time, but since I am going to miss a game in a few weeks, a team mate tried his hand on the mound. Midway thru the second inning, after we were down 12-1, our coach called me into pitch. Slowly we came back and after 6 innings we were tied 15-15. We ended up losing in extra innings, but it was exciting that we came back. After the game, I ran. We play in Kiwanis Park, so I run from the softball fields to the lake and back a couple times. At the lake the trail goes up and down some hills. As you go down into the little valleys, you feel the heat from the day. You also smell the lake. Not a pleasant smell, but it does make you happy to see the rise in the road. Who says I don't like hills. My plan was to do 5 miles. After 3 miles and a softball game, I was toast. I did the first 3 miles in 37:20 for a 12:24 pace. I reset my nike+ and decided I was going to do as best I could. I ended up doing another 1.91 miles in 26 minutes for a 13:33 pace. I did a lot of walking. This gets my mileage up to 19.67 miles for the week. I haven't done a 20+ week since the week of February 25th. Hopefully, I can get a lot more 20 mile weeks.